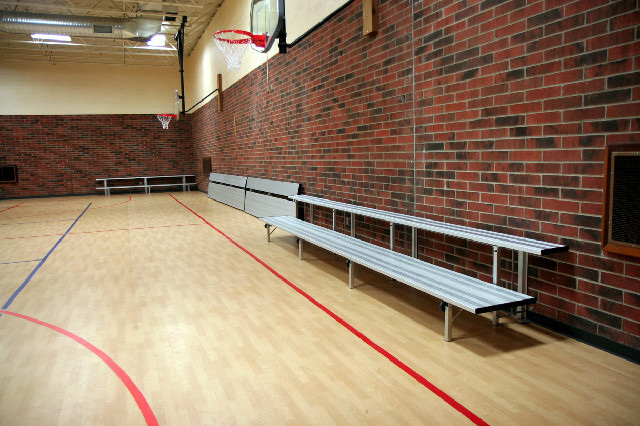 These wall mounted folding benches for school gymnasiums will save you room and setup and fold flat to the wall is quickly and easily. Very durable and they look great too! 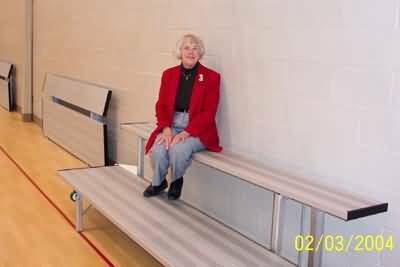 The Hide-A-Bench® is designed as a 9’ - 21’, in 3’ intervals, one or two tier seating system. The aluminum bench folds downward from its attachment point and lock into an open position. When closed, it locks into a 6” profile. It is intended to be permanently mounted to most flat surfaces. Wall material type and thickness must be verified with owners. All approvals and building permits are the responsibility of the owner. Material/Finishes Hide-A-Bench® structure, deck, and seating is constructed with anodized aluminum materials, clear anodized finish. Powder coat painted finish is an option. Exposed ends are channel end capped with a black anodized finish. Fasteners and connecting hardware are stainless steel. Mounting hardware, due to the variances in wall material, is not furnished. Warranty Hide-A-Bench® shall be warranted for a period of 1 year after delivery date and shall cover defects in material and workmanship. Click Options Tab above for powdercoating and integrated seat cushion options. We currently do not have any pictures of the Hide-A-Bench with the Padding that has been revamped. The Padding has changed on the units, each tier has a single pad that will mount where individuals will sit. When it is folded the pads are located at the top and clear at the bottom. This was changed to this style 5+ years ago. The padding with the longer riser drop is no longer available to be purchase.